This site is best viewed with screen/browser width more than 1024 pixels. Site is optimized for high resolution screens. Welcome to the home of SubhashBose.com. 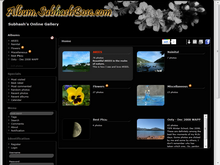 Here you will find the latest updates and informations about SubhahsBose.com network sites. Astro.SubhashBose.com is dedicated for astronomy related tools made by me and may be few other miscellaneous related information. 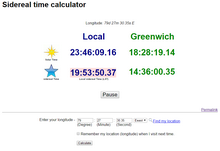 However, it has been almost six years, but I couldn't make much additions to the site, expect for the first tool, sidereal time (ST) calculator. This calculates Greenwich ST as well as local ST for a location input, which can also be selected using a searchable and interactive map. The clock updates itself from its host server time and displays ST in realtime and running mode. I had plans for more astronomy related tools, which I couldn't make due to time constrains, but hoping for some useful addition in near future. Since last one year SubhashBose.com and it's sites had gone through many changes in terms of popularity, infrastructure and in general. Let me first mention the latest change in the website SubhashBose.com itself. SubhashBose.com itself not beign a public site, (due to my negligence) the site remained unfinished and preety old fashioned in appearance since it's first launch. Today, I am re-launching SubhashBose.com with a brand new look with better appearance, XHTML compliance and cross-browser compatibility. Now it has been more than a year since SubhashBose.com is running on paid servers bearing it's own expenses. However the experience with paid services are not so well as I thought of initially, we encountered several problems and moved over few paid webhosts looking for best quality. Over time SubhashBose.com sites had gained a considerable popularity and hence the resource utilization has also increased significantly, now we get a traffic of about 20,000+ hits per day. SubhashBose.com sites are currently hosted on high quality and comparatively expensive server. We have also purchased an separate account which runs on latest cloud computing technology, this account is mostly kept unused and as a backup to our existing system, which is to be used only in time of any unexpected failures. Album.SubhashBose.com is my personal online photo and media Album, here I upload photos taken by me with my own camera. The photos and contents of this site are somewhat personal since they are related to the world around me and hence they are not for all the netizens out there. However anyone who knows me as an individual other than as the owner of SubhashBose.com are very much welcome to this site to browse my photos. This site is not meant for attracting visitors, rather it will continue to be my personal web photo album. SubhashBose.com got it's domain registered in the year 2007. Since then, many sites as subdomains of SubhashBose.com started out. Some of these network sites couldn't earn popularity and some became quite popular, namely SMS Planet and iTools. As you can see for the last two years, there was no significant changes, I couldn't give enough time for the development of sites. However, I gave my full effort to maintain the existing infrastructure for the sites to run smoothly, though there was no improvements, but within this period, the sites has gained popularity and search engine indexing. Today, SubhashBose.com and it's subdomain sites has gained sufficient userbase and receive substantial daily page hits. SubhashBose.com has a PageRank™ of 2 and good Alexa traffic rank. Though these achievements are not even comparable with other commercial sites, but these are of great achievements for a non commercial free site running on a free server, which I just started as hobby and for learning web designing and programming. Funds earned from Ad-revenue are sufficient enough for SubhashBose.com to buy paid services. After 3 years of running on free servers, SubhashBose.com and other sites is moving on paid server. The rest of the fund is accumulated for the further development of new and existing sites. The newest member site of Subhashbose.com is WordAxis.com, the successor of WordFind, which had significant contribution in the financial development of SubhashBose.com network. This is a great achievement for SubhashBose.com sites, that it has become financially independent and can sustain its own financial expenses and other needs. Thanks to all the users of SubhashBose.com network sites, who liked and helped popularizing these sites. I hope in the coming years the growth curve of SubhashBose.com network will remain same and it will have more happy and satisfied users. WordAxis is not a subdomain site of SubhashBose.com, rather is has it's own domain WordAxis.com. 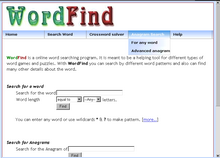 WordAxis is the successor of the popular tool WordFind under iTools. 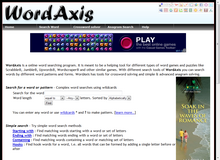 After two years of launch of iTools WordFind, numerous debugging, continuous improvements understanding the needs of the users, we came up with the new site WordAxis.com. WordAxis has numerous new featured, over hundreds of improvements of existing features, stronger algorithm and more user friendliness. LaTeX is markup language for scientific and technical document typesetting. LaTeX is mainly for creating high quality mathematical and scientific expressions using mathematical notations and symbols. This is a online helping tool to compose and edit LaTeX expressions, then it will also instantly render the LaTex expression in useable image format. 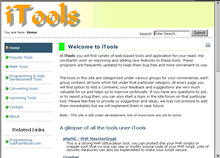 Note:- This tools is a part of the site iTools. iTools is the newest member of SubhashBose.com sites. This is a site of various kind of online tools and application. Old tools like Grapher and phpMC are now supported under iTools. This site is still under construction and many more tools are yet to come. Grapher is a program written in PHP, it is a online Graph plotting tool which plots a given input of data. With this software virtually any number of input points can be plotted, the plotted line graph is automatically expanded to fit the graph area. It also includes features like setting the colors of background, line and the points, also the size of the point can be adjusted within it. This software is packed with lots more feature which helps in easy plotting, analyzing and customization of graphs. Since the opening of SMS Planet, the popularity of the site has grown considerably. The visitor statistics of the site for the last 2 weeks is shown in the bar chart above. On 14th February, the site got the highest number of hits till date. It got 733 hits by 142 unique visitors. Though the current statistics is nothing in comparison with the big gaints of the net, but it is a considerable progress for a new site like SMS Planet. However, the real goal of success will be achieved when it will a get a good Alexa web rank and Google PageRank. SB Hosting has reopened with more reliability and stability. Now it offers a special package for beginners and learners, a small package but very reliable and easy to learn Web Hosting. Specially suited for learning webhosting, PHP and Mysql application. 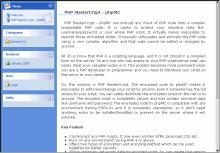 PHP MasterCrypt is a program to encode / encrypt any chuck of PHP code onto a complex unreadable PHP code. It is useful to protect your sensitive data like username/password or your whole PHP script. It virtually makes impossible to decrypt those encrypted codes. It basically obfuscates and encrypts the PHP code using a very complex algorithm and that code cannot be edited or changed by anyone. It also offers many features like to make trial versions of PHP script, protection using Username Password, setting security level by the user etc. This site is dedicated for Programming and diffrent Programming languages. This site will contain tutorial, help, source code samples, utilities and various tips and tricks related to programming. It will also host programs of third party authors. This site has just begun and it is in preliminary stage, so you might not find much useful content it, it will need some time to develop completely.